This is a finalist in the SPFBO 2017. 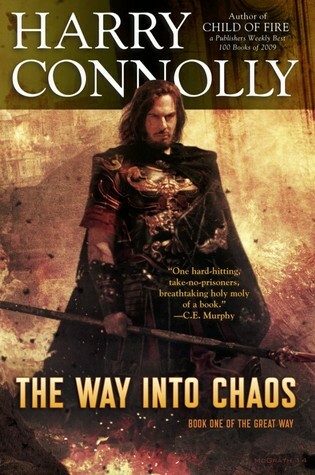 The Way Into Chaos is one of those epic fantasy books that fans of epic fantasy are sure to love. It pretty much ticks off everything you want to have ticked off in your fantasy. War? Magic? Monsters? Complex plots? Twists? Turns? Yes, friends, this book has it all. One benefit of this book is that the story is told through two points of view, rather than the sprawling host that most epic fantasy books contain. This allows readers to really get into the heads of our two viewpoint characters. The characters really do shine. In fact, I felt like they were the strongest part of the book. Truly fleshed out POV characters can make or break a book for me, and while I did favor one person over another (really, that’s just human nature), both characters were superb. Secondary characters are a diverse chunk of people, with various backgrounds and opinions. They are, likewise, fleshed out almost as well as the POV characters, which was a delightful surprise for me. This gave the book a sense of layers and made it obvious that Connolly took time to make sure that all the levels and layers of his book were thought out and detailed in the way he intended them to be. He took care with who he put in his world, and the people he wanted to use as the vehicles his story is told through, and it showed. The plot is perhaps the one area where I have something to complain about. The start of the conflict is really abrupt and felt very much like BAM: HERE IT IS to me, with very little buildup. On the plus side, that makes the book start fast. Events happen at a rapid pace, and it takes very little time for the plot to really hook the reader and pull them in, on the negative side, I felt like there was very little buildup, and very little time for me to wrap my mind around the introduction to the book before things were just taking off. I also felt, occasionally, that the plot was a little unbalanced. Some chapters would really hook me, and everything felt wonderfully paced. Others felt slow, and I had a hard time keeping my attention on them. Those chapters weren’t numerous, but they did exist. Basically, some parts of this book lagged, maybe were longer and larger than they should have been. The world building really did delight me, from the magic system to the conflict itself, to the societies and governmental systems, cultural nuances and the like. I really did enjoy this journey through Connolly’s mind, and I’m really glad I took it. I love his attention to detail, not just with his characters, as mentioned above, but with his world as a whole. This book had layers, and levity as well as darkness, and all of it was balanced very well in a world that just fit the story being told. The Way into Chaos does feel kind of like a prologue. There is a story here, and it’s contained within the novel itself, but this book isn’t a stand-alone. This is a book that is obviously setting the reader up for whatever happens next. Is that a bad thing? No, but it’s something readers might want to be aware of. This isn’t a one-off. This is a book that will demand its readers to continue on. Consider it an investment. If you’re willing to invest your time in it, you’ll find yourself richly rewarded. I really enjoyed the hell out of this book.